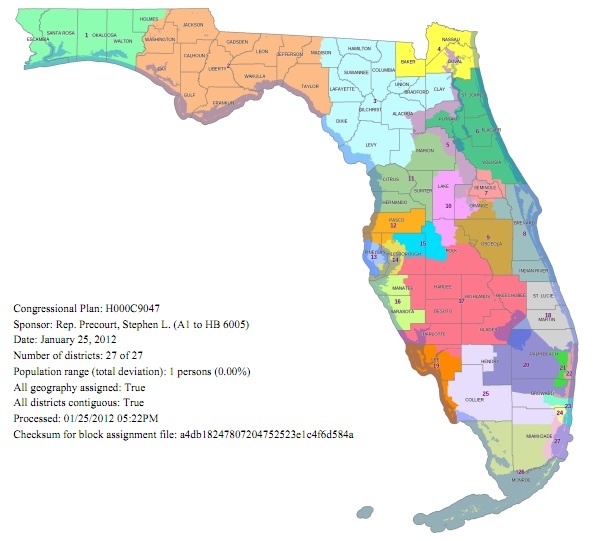 On Thursday and Friday, the Florida Legislature, which is working on redistricting for the state, came to an apparent agreement on the congressional map that both chambers are satisfied with. This quick compromise was not terribly surprising, sense both maps from the different chambers where fairly similar in many parts of the state. With the likely map now public, I decided to go ahead and do a detailed breakdown of the district map, and its effect on the state. Florida’s current legislative and congressional districts are heavily gerrymandered to favor the incumbent Republican Party. Despite the state’s swing nature, the Republicans always maintain a compelling majority of congressional and legislative seats. Even after the blue waves of 2006 and 2008, Republicans still help most of their seats thanks to the gerrymandering involved. This has been helped by the 1992 creation of 3 majority-black congressional districts in the state of Florida. 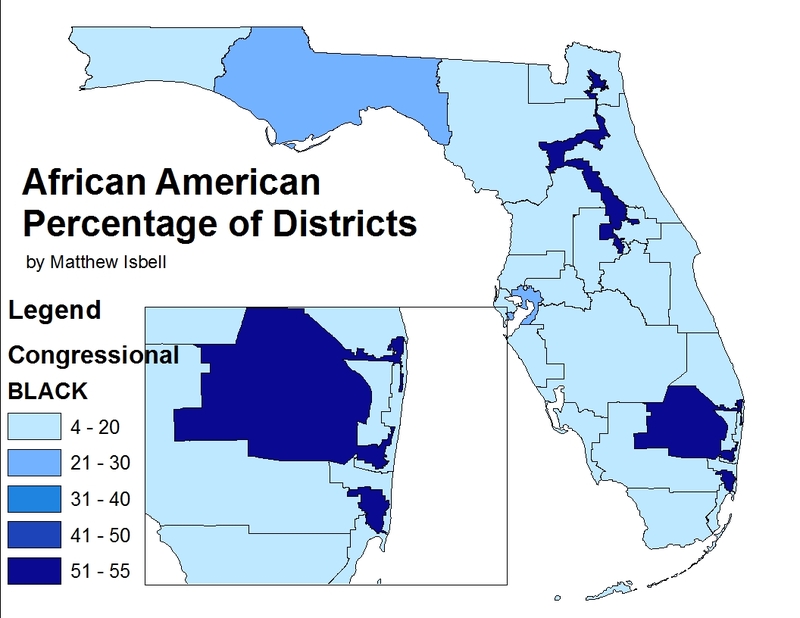 These districts, only one of which is compact, allows for Republicans to pack African Americans into these districts, and thus ensure their dominance in areas like Orlando, Tampa, and South Florida. One major change to how districts are drawn took place in 2010, when voters passed the FAIR DISTRICTS ammendments, which stated that districts must be compact, and that districts could not be drawn to favor a politican or political party. The measures passed with a healthy 62% margin, winning in many conservative states. This passage, which was something the Republican majority didn’t want, put them in a position of being forced to draw more compact districts. However, as they began the line-drawing process, they continuously said that the 3 majority-black districts could not be eliminated because they where protected by the Voting Rights Act. However, their is strong court precedent that does not back up this claim. The most telling case is Shaw v Reno. This case saw the Supreme Court strike down a seat drawn in North Carolina that, looking like a snake, packed in every African-American in the area. The district was ruled a racial gerrymander, and thrown out. The district would later being upheld in a future court case after the district was modified, and the argument for its shape was that it aimed to create a safe Democratic seat. The court, which will not strike down political gerrymandering, upheld the new district. However, sense FAIR DISTRICTS exist in Florida, any such explanation for the majority-African American districts can’t be used. 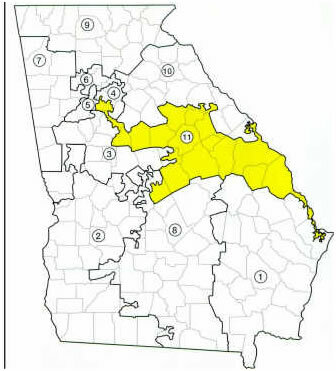 Another case, Miller v Johnson, saw the Supreme Court strike down a similar African-American packed district in Georgia. There is clearly court precedent that badly-drawn districts to pack in minorities is not allowed. I will get back to this issue in a little bit as I begin to go through the different districts. The plan proposed by the state legislature is for 27 districts, with 2 new ones being added thanks to results of the US Census. Both new districts are concentrated in the fast-growing I-4 corridor region. One is a Republican-friendly seat, and the other is a Democratic-friendly seat with a strong hispanic minority (41%). Another view, without the county lines and other landmarks… below..
First, lets start off with the 5th district, which used to be the 3rd. Its a majority-black district that snakes its way from Jacksonville down to Orlando. it packs in African Americans wherever it can, and in doing so, ensures most of the districts around it in the Orlando district favor Republicans. Followed by this, we have the the 20th, formerly the 23rd. 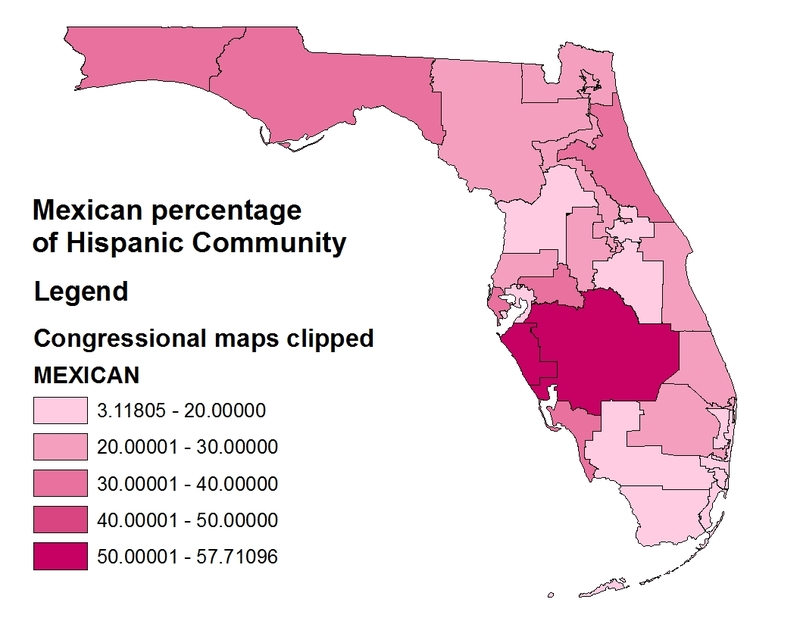 This is the other racially gerrymandered district, which used open Everglades land and Sugarcane fields (with little population) to connect the African-American communities in West Palm Beach and Ft. Lauderdale. This crazy result leaves us with the 22nd district, which connects with the 20th, looking bizarrely shaped as well, hugging the coast. 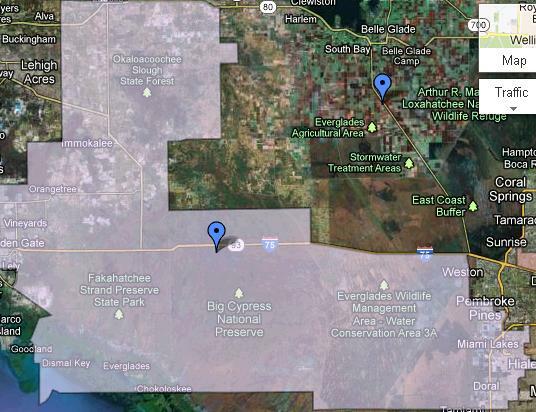 Then we have the 24th, a majority-Hispanic district, which takes communities in Miami-Dade, goes across federally protected Everglades land, and connects other communities in the West Coast. 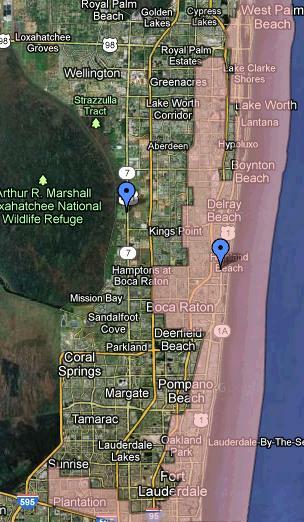 The next district hugs the coast of the Tampa metro area, and then moves into Pinellas County, which is across the bay. In doing so, it ensures the district in Pinellas is slightly less Democratic than it could be. These are just some of the highlighted problem districts. Look back and the first two, the 5th and the 20th. The Republicans claim they are protected by the VRA as majority-minority districts. Well, take a look at the districts the court struck down in the two Supreme Court cases I cited earlier. These districts where struck down for racial gerrymandering. 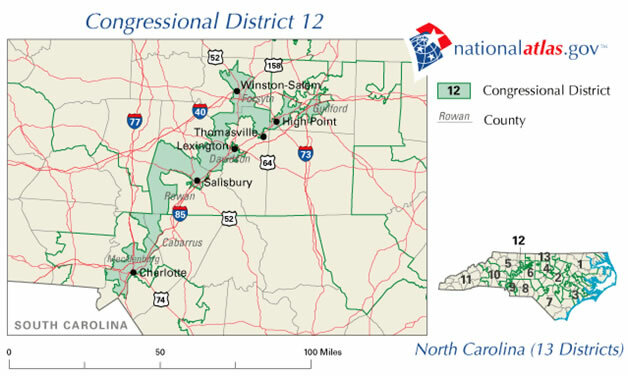 I version of the North Carolina 12th only exists because it was eventually deemed a political gerrymander. However, with the FAIR DISTRICTS passage, Republicans cannot claim as such. Ok enough legal stuff… lets see how the districts break down overall. First lets take a look at the racial breakdown of the districts. I have colorized a google map of the districts based off their racial statistics. In the map below, you can click each district to get the presidential and racial breakdown. The districts are colored Red for majority white, Blue for majority black, and Green for majority hispanic. In addition, a lighter shed a Red indicates white is the largest racial group in the district, but less than a 50% majority. Just click the link above and you will get the google map with everything I described. What we see is 3 majority Hispanic districts in South Florida, the 3 traditional majority black districts. In addition, the 9th district (the light red one in Orlando area)is 43% white, but also 41% Hispanic, also, the 14th and 23rd are less than 50% white and thus considered minority-access districts. In addition to the basic breakdown, I looked even further at the racial components of the districts. First, let me show you guys all districts colorized based of the percentage of the Voting Age Population that is African American. What we see here is that a vast majority of the African American population is concentrated in the 3 majority-black districts. While the 24th district (the southernmost one) is nice and compact, and thus makes perfect sense, it takes the squiggle lines of the 3rd and 20th to achieve 50% African American status. Both these districts are only 50% black voting age population. It takes all that line drawing to achieve such a goal. This screams of racial packing, and a racial gerrymander. Ok, so what about the Hispanic population. 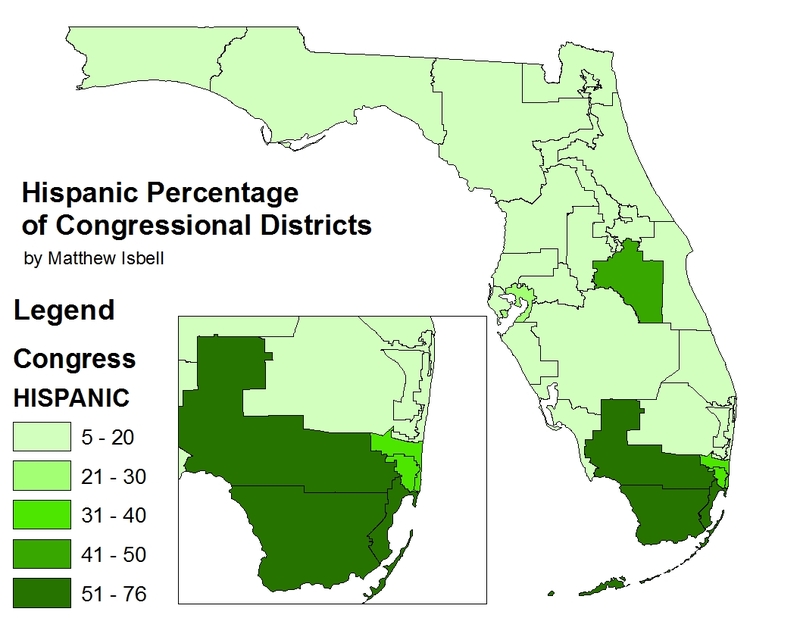 First, lets take a look at the same type of colorized map for Hispanic percentages of a district. This map shows that a large portion of the states Hispanic population is centered in south Florida. The three majority hispanic districts are in the south, but there is also the new 9th district and its 41% Hispanic population. In addition, the 23rd and 24th (which is also majority black) have sizeable minorities of hiospanic residents. Finally, the tampa-based 14th has a respectable 27% Hispanic population. 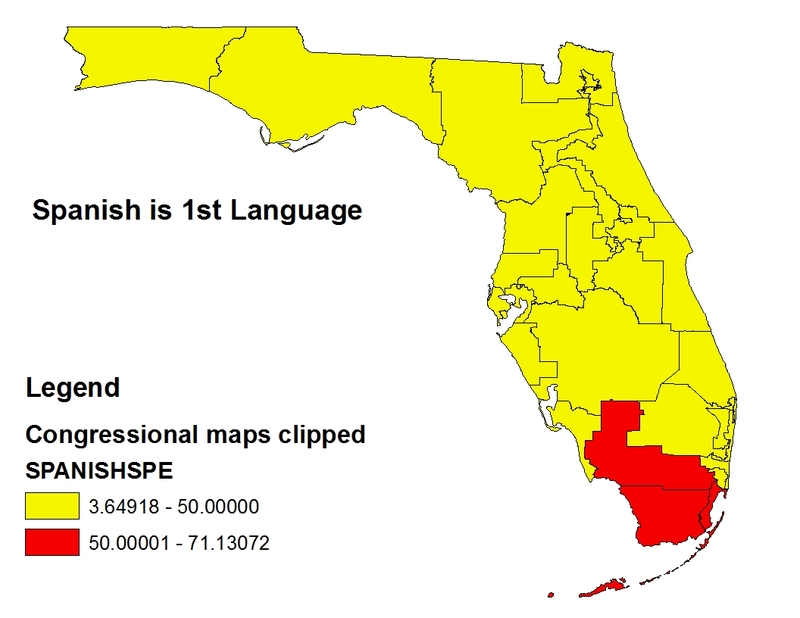 Now, this map simply looks at Hispanic population, but as anyone from Florida knows, Hispanic is a very general term. Florida is unique in that it has a sizable Cuban population, which trends Republican, while Hispanics overall trend Democratic. While a majority-Hispanic district is normally likely Democratic, that is not the case if the Hispanic population is largely Cuban. Thats why I created another map showing the percentage of the Hispanic Population that was specifically Cuban. With this map, we see that the three majority-hispanic districts are concentrated Cuban. With 50% or more of the hispanic population is Cuban. 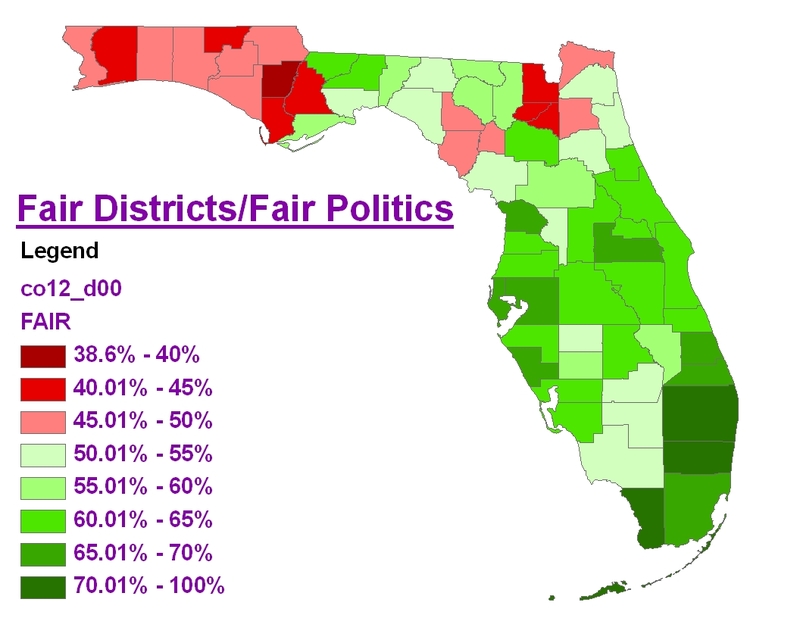 This helps show why (as we will see soon) these three districts are Republican favored or lean Republican. 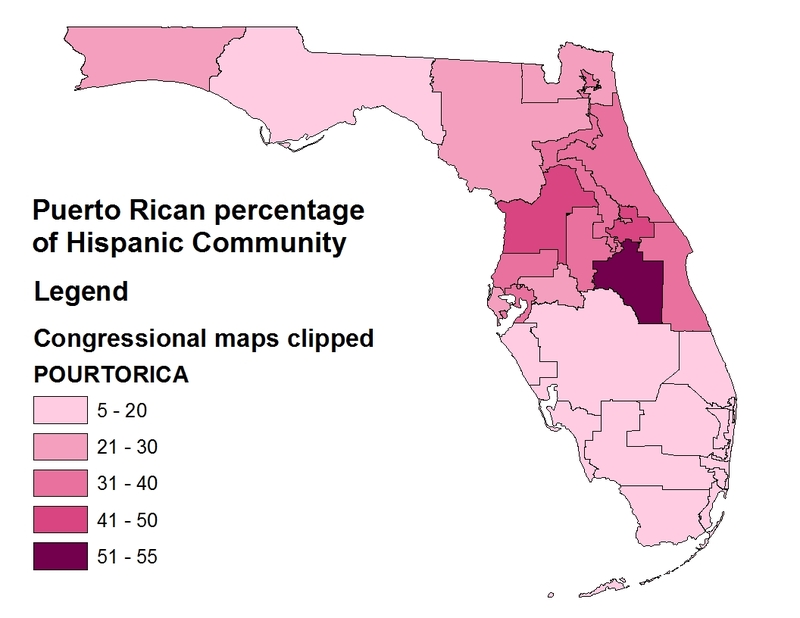 Another breakdown of the Hispanic population is Puerto Rican, which is a sizeable community in Florida. Map below. The Puerto Rican population is clearly centered in the North/Central Florida area. It is especially prevalent in the new 9th district. 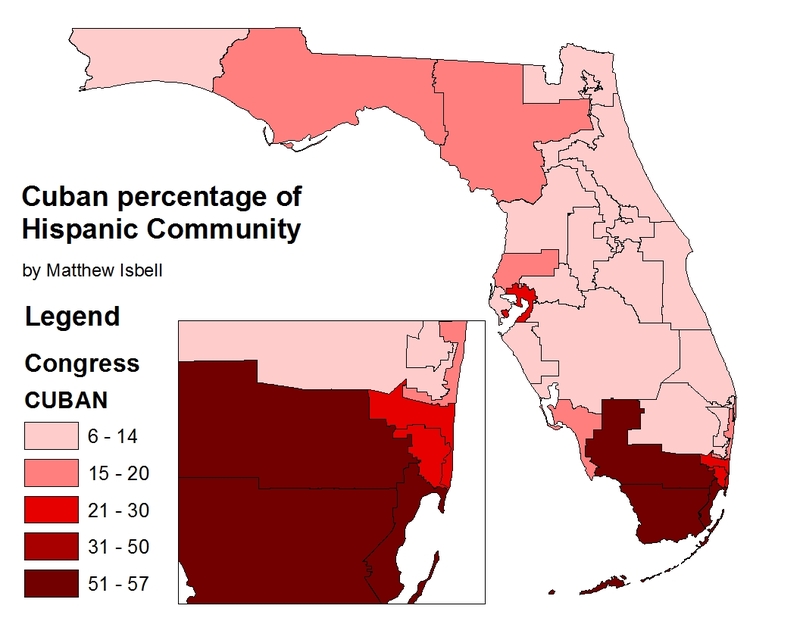 Finally, just to show the contrast between Florida and the Southwestern states that share large Hispanic populations. I mapped the percentage that consider themselves Mexican. This shows that the only strong Mexican concentration is in some central districts (around the sugarcane fields and farm area) that have low Hispanic population to begin with. Overall the hispanic population is largely Cuban, Puerto Rican, and Central and South American. A few other demographic notes, this map below shows the districts broken down by spoken language. This map just highlights the dominance of Spanish in these three southern districts. Important note is that this statistic means Spanish is the first language, but not the only, as English is still a second language for almost anyone who can vote. These districts through represent an area (especially true for Miami-Dade), where Spanish-language political advertisements are likely to be used as they are now. Ok so we have broken these districts down in demographics. Lets move on to partisan breakdown. Now, when we look at how these districts break down on a partisan level, we see a real problem. There are many ways look at the partisan nature of a district, and i will explore several past races. (I did not use registration since in north florida its not reliable, because while Democrats dominate registration, they tend to vote Republican at the national level). First I took a look at the districts by Presidential Election result from 2008. This gives a general idea of the districts leanings, especially sense we are dealing with a federal office that is being competed for. As i wrote in a blog entry months ago, the era of “politics is local” is coming to an end thanks to the way media is now. If the national party performs badly in an area, it will be harder for congressional candidates to win and hold such seats. Here is the google map link, districts are colorized based on result, and clicking each district gives you the presidential numbers. This map shows that Obama only won 10 districts out of 27. This is despite winning the state overall in 2008, but he only wins 37% of the districts. Most of the districts are safe or likely democrat, and 2 districts are hardly easy for Dems to win (keep in mind Obama is the strongest national democrat sense Bill Clinton). This makes Democrats taking control of the congressional delegates highly unlikely. Yes Democrats can make gains in McCain districts, just like Republicans can hold Obama districts. Simple fact, the gerrymandering done ensures Republican dominance. The 5th district moving into Orlando ensures the 7th and 10th are less Democratic than they would be taking in their African American population, while the 14th encroaching across the Tampa bay ensures the 13th is only nominally Democratic. In addition, in the south of the state, I am sure the three majority hispanic (with strong cuban populations) where cracked in three to ensure the Cuban population influenced all three districts. Presidential results is one form of looking at it. 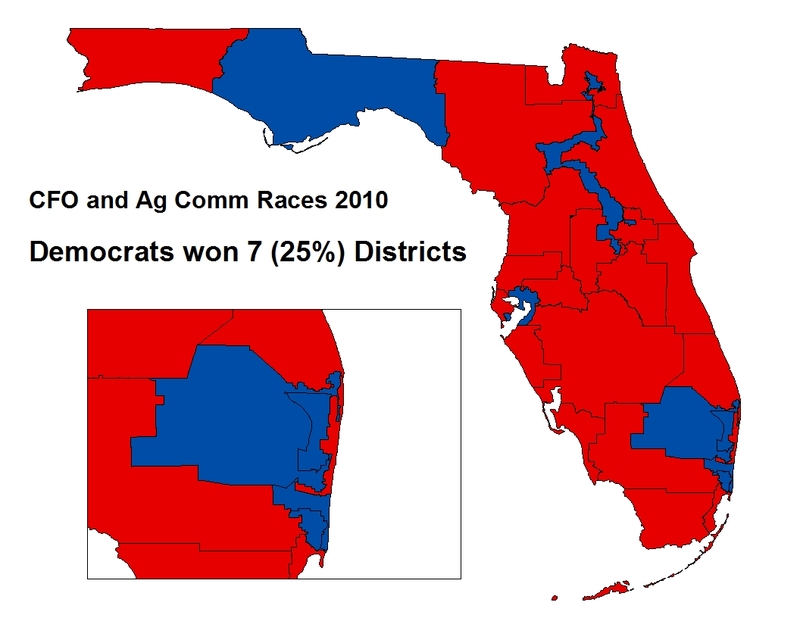 Lets look at the 2010 Governor’s race, where Democrat Alex Sink lost to Republican Rick Scott by 1%. 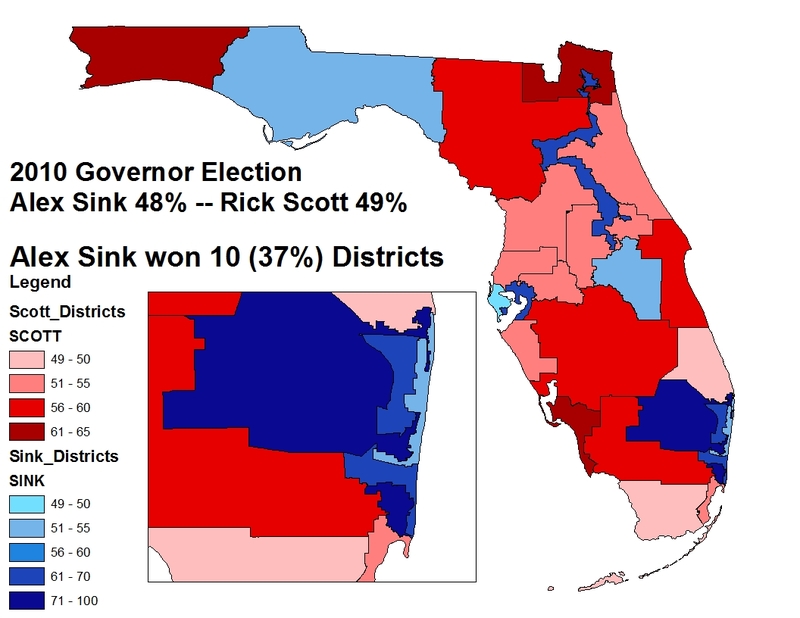 Sink performs the same as Obama, winning 10 districts. However, this is caused by her winning the 2nd (which Obama didnt) but losing the 18th, which Obama did. Still, this means a 48% win results in a 37% of districts. While Gelber did worse than other Democrats in 2010, which was a terrible year, which influenced down ballot races. 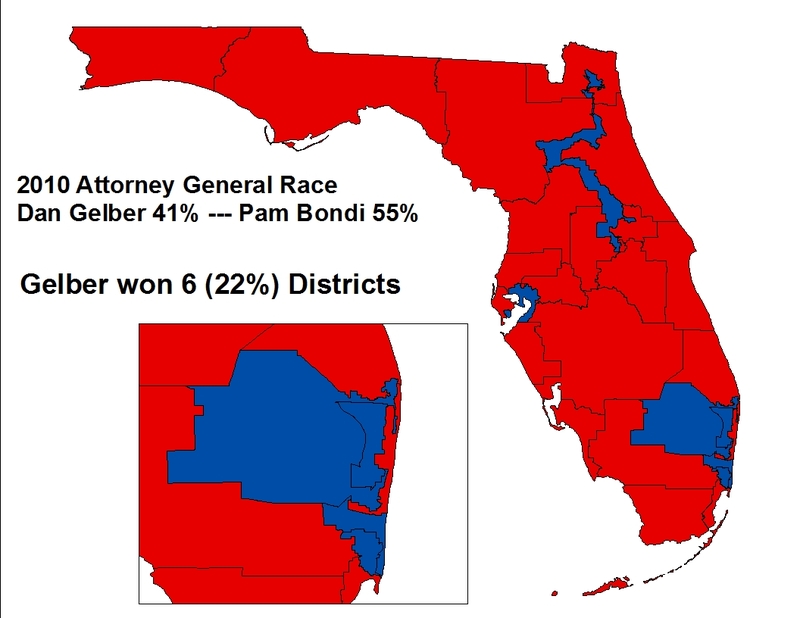 Again, Gelber only got 6 districts, 22%, compared to the 41% of the vote he got. He lost severla Obama districts, including the 22nd and the 9th. Scott Maddox and Laurane Ausley, who ran for Agriculture Commissioner and Chief Financial Officer, won an additional district (the 2nd) because of their ties to the area, still, their average of low 40%, high 30% in their races only translated to 25% of the districts. If we look back to the 2006 governor’s race, we see a similar dynamic. 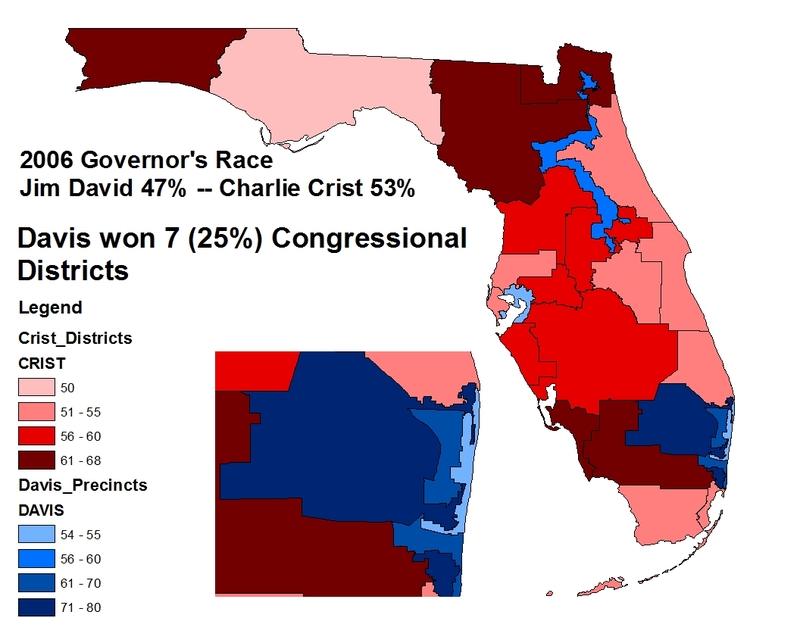 Davis also only one 7 districts (25%) despite getting 47% of the vote in his race against Charlie Crist in 2010. We continously see that Democrats underperform in the congressional districts, regardless of their showing statewide. There are only a few instances of Democrats overperforming in the new congressional districts. First, we have the 2006 CFO race, where Alex Sink won her cabinet seat with a strong win in a Democratic year. Sink, who is from North Carolina, made strong inroads into rural areas that other Democrats didn’t. This is reflected in her performance by district. Sink’s inroads in the rural areas in the north and west allowed her to over perform and win several Republican districts. The other over performer is Bill Nelson, who has a knockout win for re-election to his Senate seat in 2006. Nelson won all but 9 counties, and that is clear when you se the results by congressional district. 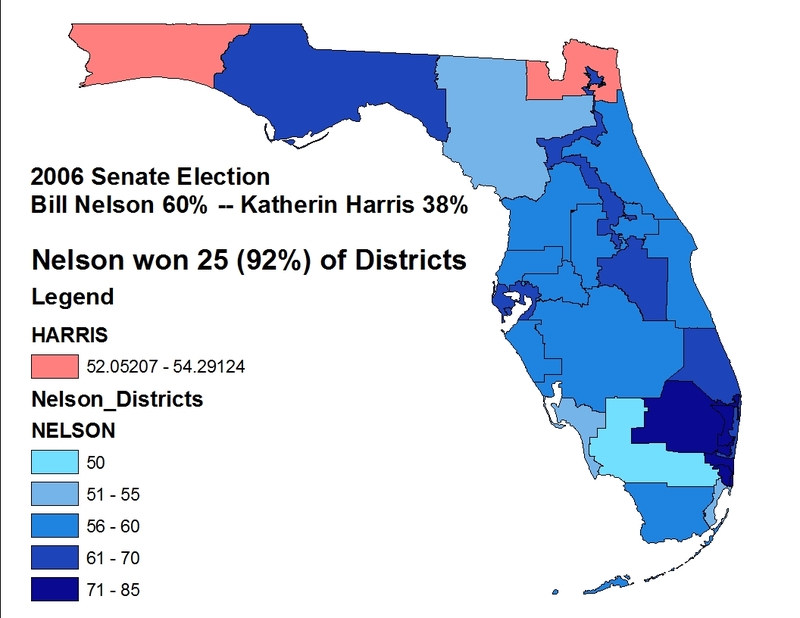 Nelson’s win was so strong and so state-wide that he got all but 2 districts. However, this performance will not be repeated in Nelson’s 2012 election, this is without a doubt the high point. At the end of the day, strong local candidates can win some of these tougher districts, but these case studies show the scale is without a doubt tipped in the Republican’s favor. Hope this entry helped give insight into what the new congressional districts may look like. Don’t forget though, sense these districts clearly do not adhere to the FAIR DISTRICTS amendments passed in 2010, there will be a lawsuit and possible court intervention to change the maps. What eventually happens, is up in the air. By collegematt in Elections, Politics, Uncategorized on January 29, 2012 . Excellent analysis! I was the only citizen to speak at the hearings in early January in Tallhassee. None of the Republicans would talk about the maps. I had similar data and showed the incumbent and party favoritism. I did get the one of the redistricing staff to admit that the term “intent” in the amendments was what they used to ignore the partisan drawing of the maps. Intent is not “results” so they just said they didn’t discuss the partisan stuff. If it magically turned out partisan, it was OK. Now they want to protect themselves from having to testify about what they did.